Most holidays pass without any unfortunate incidents, but tourists worldwide can often be targeted as victims for opportunistic crimes, especially petty crime. It may not seem petty though, when someone's made off with your wallet and you have no cash to survive on for the rest of your trip. Do your research - find out about crime in the area you're visiting before you leave. Also get some information on the safety and security situation where you are going. The Foreign and Commonwealth Office (FCO) is a good place to start if you're looking for alerts and general safety advice - they produce regular Travel Advice Notices. Make sure that you have adequate travel insurance to cover you in case of an emergency, and take the helpline details away with you. 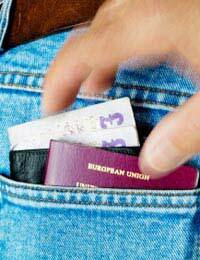 Your number one most important possession abroad is your passport, so keep it safe at all times. If the worst happens and you lose it, you need to get in contact with the nearest British Embassy or High Commission. If your passport is stolen, you need to report it immediately to the local police so you can get a police report. The Embassy will need the police report to issue you with a replacement passport, and you'll also need it for insurance. You'll need to fill in forms to get your existing lost or stolen passport replaced, because of identity theft. Usually, a Standard replacement passport can be issued to British nationals in most parts of the world, but the time it takes and the type of replacement document you'll get will depend on where you are and your particular circumstances. Emergency passports can be issued straight away but are only valid for the journey back to the UK. Before you go away, it's a good idea to empty wallets and handbags of any non essential documents that could identify you - and definitely don't write down any PIN numbers! As soon as you realise your card/wallet is missing, contact the issuer. They will have appropriate measures they can put into place to stop unauthorised use of your card. Traveller's cheques aren't a great deal of use without your signature, but all the same, if they do go missing or are stolen, report this to the issuer so that they can be cancelled. Whatever you do, don't sign your cheques until you need them! Report the incident and what's been stolen to the local police immediately. Get them to write you out a statement or crime report as you'll need this to be able to claim anything back from your insurance. If you are attacked, contact the local emergency services if you need medical help fast. Ambulance times can be erratic in some countries so it may be easier if you can get to a hospital without one, to do so. Contact your nearest British Embassy or High Commission. They will be able to give you a list of local lawyers, and doctors if necessary, contact your relatives and cash a cheque for up to £100 sterling to keep you going. They can't give you legal advice themselves though, and they won't help with the finances except in exceptional circumstances when they may be able to give you a loan. In return for the loan, they will take your passport if you still have it, and issue you with a document that covers you to travel - you will get the passport back when you pay the loan back! They'll give you an emergency, single journey travel document. Your passport will only be return upon full repayment of the loan and the cost of issuing the emergency travel document. Contact your insurer's emergency helpline. Ask their advice about what you should do, as they will probably have a dedicated legal advice line and helpline for this sort of situation. Unfortunately, crime is a fact of life wherever you go in the world, but if it happens to you, it's reassuring to know that there are systems in place to protect you - you're not alone! Please help me! I am stranded in Nigeria with no money, though I have a return ticket back, it is scheduled at a much further date and not only was I kicked out of the home I was staying in, now I have no money for a hotel or even food! I am a British Citizen and I am also on Sertraline 100mg for my anxiety and depression and my repeat prescription needs to be approved with me taking a blood test back home with my GP! Please I fear for my safety and well-being, I also fear for my mental health please if there is anyway you could help me get back home, please, I’m begging you! Tell him to contact the British consulate in Cape Town or the British High Commission in Pretoria.